Virtualization is a term that refers to the various techniques, methods and approaches, in this post I will provide overview of x86 hardware virtualization.Virtualization, in simple, running more than a operating system in an isolated and secure environment on a single physical hardware. History of Virtualization begins with IBM mainframes (1960s), back in old days engineers worry that the hardware is not completely utilized all the time and the Mainframe hardware cost is huge. So they pioneered Virtualization by partitioning their mainframes to perform multitasking to utilize their hardware efficiently. Hardware Virtualization on x86 platform was introduced originally by VMware(1998) and since then many companies entered into market including Mircosoft, Citrix, Redhat…etc, but VMware continues to lead in the x86 Virtualization market. Virtualization is introduced to address various problems in the Physical IT world. In physical IT world not only the Hardware is under utilized but also it has various barriers like consuming various hardware parts, electricity, datacenter space and its administration. Traditional computing vs Virtualized computing. The basic goal of virtualization is to run more than a operating system on the same physical hardware, today most of the organization do not utilize their completely, if there are 100 Physical servers hosted in a datacenter and if the average utilization of a server is 20% can be consolidate into 20-22 physical servers (where 2 servers can be kept as a buffer) from 100 servers., which will save huge CapEx (Capital Expense) , OpEx (Operational Expense) and also ease of administration. 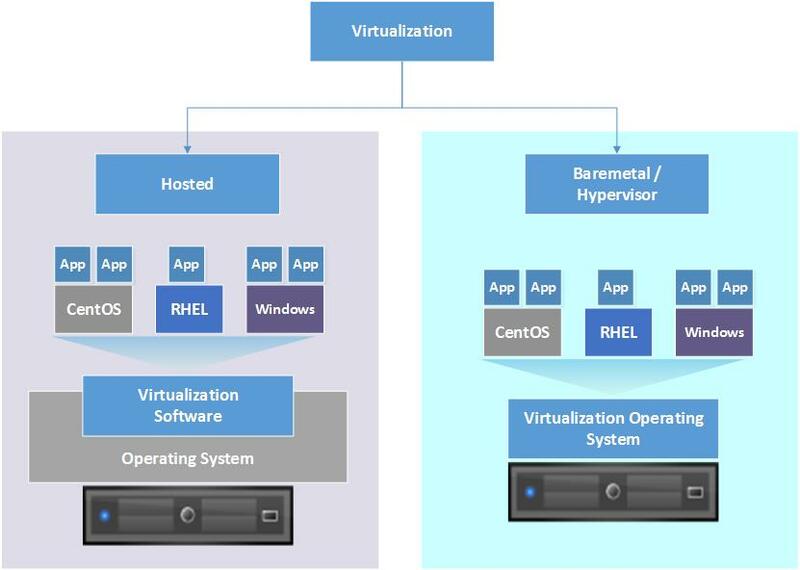 Hardware Virtualiztion itself can be achieved by two methods, Hosted and Baremetal. in Hosted virtualization, Virtual machines are created from the virtualization software that is installed on a operating system.Often Hosted virtualization is used for testing purposes because of OS dependency. The base operating system is designed for various purposes to compute day to day activities, so it will not give optimal results for the virtual machines, hence hosted virtualization is not considered for production environment. Hosted Virtualization software: VMware Workstation, VirtualBox, parallels workstation, Microsoft Virtual PC..etc.. The term Baremetal refers physical server. Baremetal virtualization is powerful and used in the production environment. 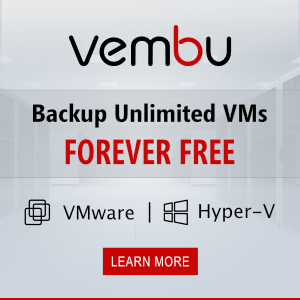 Instead on running a VM on a virtualization software on top a Operating system, VMs will be placed directly into virtualization OS called hypervisor. The hypervisor is mainly designed to manage physical resource allocation to VMs, so it gives optimal and efficient performance. 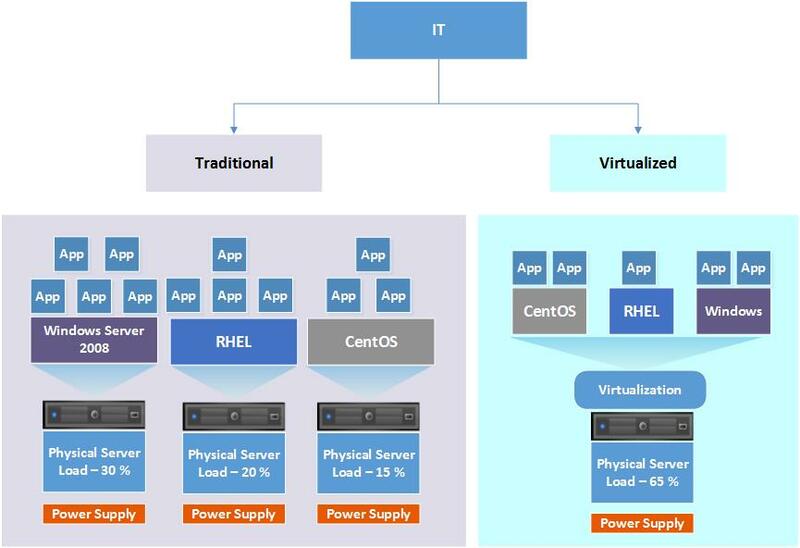 Hypervisors: VMware ESX/ESXi, Citrix Xenserver, Hyper-V..etc.. Host: Physical Server that host Virtual Machine. Host OS: Hypervisor – Virtualization Operating system. Virtual Machine: Combination of several files that forms a machine which allows to run OS. Guest OS: Operating System that installed on Virtual Machine.